In Matthew 24:39, notice carefully the phrase “they knew not until the flood came, and took them all away.” Could they not have known? Yes, of course, but they DIDN'T WANT TO KNOW. While Noah was preaching, they couldn't have cared less. Noah preached for 120 years!!! The wicked world is the same way today, saturated with evil and indifference. People are selfishly going about life as usual, eating, drinking and giving in marriage; while ignoring THE TRUTH in the face of impending doom and judgment. Genesis chapter 6 describes an evil and wicked world that didn't care. They ignored Noah's message of righteousness. They could have known, but they didn't want to know. They didn't care. People need to know the message of Jesus Christ. Unfortunately most people are wrapped up in themselves and don't care. Most people are lost and on their way to Hell. Ironically, most of them are religious. Most religions corrupt the Gospel by adding sacraments, works, water baptism and religious devotion as requirements for salvation. But the Bible says in Romans 4:5, “But to him that worketh not, but believeth on Him that justifieth the ungodly, his faith is counted for righteousness.” This is the simplicity that is in Christ Jesus (2nd Corinthians 11:3-4). Jesus said the Last Days would be like the Days of Noah, when people went about life as usual and didn't see the impending doom, because they didn't care to know THE TRUTH. The flood came and swept the wicked away. They all went to Hell in their unbelief, having died in their sins. The Apostle Paul quoted the words of Isaiah the prophet from Isaiah 53:1 . . . Throughout human history, most people have turned a deaf ear to the Gospel of Jesus Christ. They all went to Hell (Psalm 9:17). In Luke 16, Lazarus was carried by angels to Heaven, but the rich man went to Hell. The rich man cried out from Hell, asking Abraham to send Lazarus to warn the rich man's brothers. Abraham told the rich man in Hell that if the brothers wouldn't listen to the prophets and God's Word, then nothing would persuade them . . . If people will not heed the Bible's warning, and that of God's men preaching the Word, then the wicked won't believe at all no matter what happens. Most people today are living selfishly, ignoring the truth and have forgotten God. It is interesting that the Bible says those who perished in the flood KNEW NOT until destruction was upon them. They sincerely didn't believe Noah's message of coming judgment and doom. The rich man KNEW NOT until he awoke in the fires of Hell. The people laughed and mocked at Noah, just as fools laugh and mock at the Bible today. Many people alive today will not wake up until they are burning in Hell with the rich man, because they refused to listen to the Bible. We are living in the Last Days. Jesus Christ is going to return soon, and most of the world will be left behind to worship the Antichrist. Ultimately, the pleasure-seeking world will be swept away in their unbelief and wickedness and cast into the lake of Fire. 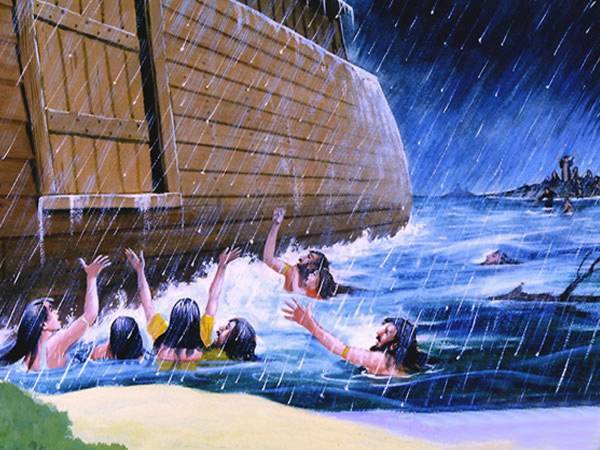 No one listened to Noah except his immediate family. The inhabitants of Capernaum didn't listen to Jesus. The entire city of Gadarenes asked Jesus to leave their coasts and never come back. America banned prayer in 1962 and the Bible in 1963 from our public schools. America has forgotten God. Most people alive today are going about life as usual, eating, drinking and giving in marriage; while totally ignoring THE TRUTH of God's Word and what's really going on in the world today. While we are facing impending doom and destruction in this world, most people couldn't care less. Just as the world didn't care before the flood came and swept them away. Just as Sodom didn't care before God reigned down fire and brimstone to consume them. Just as Jerusalem didn't care before Babylon utterly destroyed them. Just as the rich man didn't care before God cast him into the flames of Hell. So also is the wicked world today, who don't care about THE TRUTH; but eternal judgment is coming!!! The gospel is NOT amending one's sinful ways, nor is it surrendering all to Christ, nor is it making a commitment to God, nor is it joining a church, nor is it forsaking the world, nor is it getting water baptized, nor is it opening one's heart to God's love, nor is it asking Jesus into one's heart, nor is it praying a prayer, nor is it giving one's heart to God. A person may do all of these these and yet never be saved at all; thus, dying in one's sins and spending eternity in the flames of Hell. So what then is the Biblical gospel?